In the case of the high profile I project (featuring among others Abbath from Immortal) it was an almost definite “no”, as they presented the just-decent ‘Between Two Worlds’ album. The case of Ereb Altor, I’m not so sure. 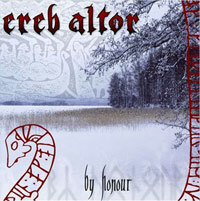 Where I focused on the rock element of the late Quorthon’s work, Ereb Altor have managed to capture a great deal of the crude folky, yet epic element and in essence what I believe made Bathory’s output so capturing. 'By Honour' is for the most part a slow, powerful soundscape that in your mind places you on a snow-tipped mountain top somewhere up in the far north, clad in your Viking attire, axe and sword in hand, with a view of the dark forests, beautiful lakes and the smoke from the burning villages on the distant horizon. You know the feeling. Ereb Altor are guilty as charges of cloning activity, but in my ears they come out truer and much more heartfelt than the I super group did. A must-try for Bathory fans of the Blood Fire Death, Hammerheart, Twilight of the Gods phase.